from booking to checkout all of the staff we encountered were professional and attentive. Not our first visit to West Bay Village and definitely not our last. From transportation through to property every detail is covered and when you visit you are the priority. You want for absolutely nothing. Property is immaculately cleaned and security is always visible staff is pleasantly available. Not one complaint, ever. REPLY: Thank you, THANK YOU! We're happy to continue having you back! Loved KD House, so quaint and perfect location. Its nicre to spread out and not be stuck in a one room hotel! The price for the house is so reasonable. I would only suggest maybe supplying candles for the blackouts or more flashlights. And maybe citronella candles for the mozzys! We had a great time! Thank you!! REPLY: Thank you for your suggestions, we will follow up with more candles, flashlights and something for the mosquitoes! Awesome! Extremely friendly and always willing to assist. Everything was perfect, just like last year, THANK YOU, EVERYONE!! REPLY: Thank you, hope to see you next year! I cannot overstate how awesome the Sunset Beach House is! We travelled with 21 people for my brother's wedding (which was held on the gorgeous beach in front of the house) and rented the entire property, the apartment behind, and a couple of other nearby properties. The grounds are gorgeous and all your needs have been considered and accounted for. Hibiscus blooms abound and you'll see hummingbirds, butterflies and macaws flying around. At dusk and dawn, speedy bats fly all over filling up on mosquitos. There's a hummingbird feeder with tiny showy birds flitting all over, and a house cat who comes around. There are also healthy local dogs who come by and hang out. Johnny, the caretaker, is absolutely amazing. He took great care of all 21 of us the whole time, picking fresh mangoes and coconuts from the property's trees for us to enjoy, cutting open a coconut and popping a straw in for delicious fresh coconut milk, sweeping the sand off the bar and walking paths, raking the beach, building beach bonfires for us, setting up a volleyball net, and even bringing out an oscillating fan and holding it for us to clear out the smoke and heat one hot night as we grilled on the huge gorgeous BBQ grills in the bar area. He unlocked the "toy chest" and bar refrigerator every morning before we awoke and locked them up after we went to bed. Johnny made an already fantastic experience absolutely incredible! The house itself is well appointed with icy a/c in every room, fans in all the outdoor spaces, a gorgeous deck, modern appliances and bathrooms, a fully functional kitchen (although the only two drawbacks are that the knives are very dull and there is no dishwasher, but I really can't complain.) The beds are comfortable, the water heater kept up with our giant group, and there are plenty of hammocks scattered around to keep everyone comfortable and happy. It's easy to cook at the house - the kitchen has everything you'll need and the bar has a huge gleaming BBQ grill. The kitchen (and all the bathrooms) provide bottled water, and there's even a filtered water ice maker in the outside bar. We spent most evenings at the bar outside or at the end of the dock catching the ocean breezes. There's even a very popular hammock on the dock as well. The reef is close enough to swim, and it's gorgeous snorkeling. I'd strongly recommend one of the house's paddleboards or kayaks to get out there so you're more visible to the water taxi traffic that you'll have to cross to get to the reef. We easily walked back and forth between the house and both the West End and West Bay. West End is great for shopping, little bars and fun places to eat. West Bay is more upscale and has the best beach around and also great restaurants. Technically the water taxis stop running around 6pm, but we were always able to find one at West End up until 9pm. While in Roatan, make sure and visit Victor Bodden's and play with the monkeys and hold the sloth and brave the ziplines. Book directly through them for the best price. The people there were great too! 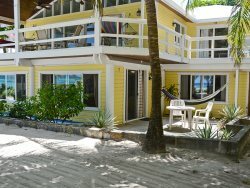 To make a long story short, the Sunset Beach House is simply the best place to stay on Roatan. You will be SPOILED! Great team!! Very friendly, helpful & knowledgeable. Love the view, the location is excellent & the new couch is super comfy. Wish there was a generator for when power outages occur. The unit could also use some new flatware & better quality non stick cooking pans as well as new placemats & coasters. REPLY: Thank you, we will be making upgrades next month when the owners come! We look forward to seeing you again soon. The house was beautiful, we had everything we needed, we will come back it was a Wonderful Vacation,thank you again. REPLY: Thank you, we look forward to seeing you the next time! We were travelling with a young child who locked the bathroom and shut the door as he left. We called Island House and they arrived within 15 minutes and opened the door within 5 minutes. They were EXTREMELY friendly and kind! Also upon check-in, we were provided with several excellent ideas for dinner and beach spots on the island that we wouldn't have found on our own! Annabel House itself is a beautiful home with everything you need to relax. We were travelling with 3 adults, 2 toddlers and a teenager. We each were able to find our own space in the house for privacy and relaxation. The hammocks on the wraparound porch are IDEAL for naps! I tried to read in the hammocks each day but the breeze cooled me and rocked me to sleep each time. The view from the deck and the sounds of the ocean are unmatched! REPLY: Thank you, we are happy you enjoyed Annabel and your stay with us! Island House (guest services) took care of all of my needs; they were friendly and easy to work with, and everything went smoothly from beginning to end. I spent three weeks at Annabel in January, 2018 its a comfortable and spacious island home, overlooking the sea, and a GREAT value compared to a hotel. Located in one of the best neighborhoods on Roatan, Annabel offers close-by shopping, diving, restaurants, beaches, and other activities. Youll definitely enjoy your time at Annabel! REPLY: Thank you for your great review, we hope to have you back with us soon. Everyone was super friendly and helpful, and we very much enjoyed talking with all the staff. It was amazing and beautiful. A perfect place for children to enjoy, and the gardens are impeccable. We also liked how the houses include information and resources for recycling, but we thought there could be more emphasis and information about the natural resources on the island. We will come back another time! REPLY: Thank you very much, we are happy you enjoyed yourselves. We look forward to having you back! The house is beautiful, very spacious, ocean views are amazing! location is a little far from the town, but close to Infinity Bay. Very friendly. I tried to figure most things out by myself, but when I finally had to call for assistance, I realized I should have called earlier- they were so very warm and helpful. I love this place and would stay here again. Only things I would point out are regarding outside maintenance of grounds, there is some litter at the driveway entrance that is not a nice welcome- also, the hammocks on the beach need to be replaced. I believe they are noted in the property description so regardless of whose they are they ought to be functional and they arent. REPLY: Thank you for your observations. We've talked to the caretaker about the garbage and hope to have new hammocks very soon. We hope to have you back! Friendly and effective house manager. The property and its surrounding over exceeded my expectation. We had a great stay at the Bonito house beach, spacious, and clean house and well managed by friendly Tammy. Located between West End and West bay, its a nice walk to either place. It was rather difficult to found the place, but without a physical address, our taxi driver managed to found this little gem by the water. I definetly recommand it. REPLY: Thank you for your kind review, we hope to have you back!